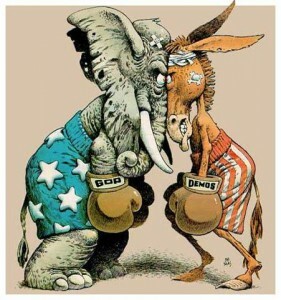 America Revealed: Are Republicans About To “Strategically Default” On America? Are Republicans About To “Strategically Default” On America? Ezra Klein says it best — the fact that the President has come out and shamed the Republicans is pretty much proof positive that the negotiations have ended on the debt ceiling. Now, it’s just all sides trying to win the PR war over who gets blame for the fallout. I have to admit I’m surprised that we got here. Wall Street donates big time to Republican candidates. I did not expect Republicans to refuse to budge, knowing that not raising the ceiling will likely crash the market. I must not have understood exactly how much money the super rich would lose if their tax cuts are rescinded, or how many donations big business has lining the coffers at this point. Because in the end, that’s what it comes down to. The administration is meeting them on entitlement cuts — possible changes to Medicare, Medicaid, Social Security, everything that the lower and middle class needs to survive. But it still isn’t enough to fill the hole, the Democrats ask for a little more revenue to offset it. In essence, to ask the rich and corporations to take on a small part of the burden, too, so it’s not just the poor being asked to take cuts. And Republicans have said absolutely not. Only the poor should have to suffer. I feel the need to repeat this — the poor should bear the burden of our country’s debt and have to have to make sacrifices to fix it. The rich, the businesses, they should be allowed to carry on, and not feel any pain. Now, rather than face their responsibilities and obligations, they are being criticized by the GOP for somehow “getting off easy” by only losing their homes, and not being held responsible for the lost debt they owe. Even worse, according to conservatives, some people who could actually pay their mortgages if they want are instead choosing to “strategically default” on their homes, walking away and refusing to pay a mortgage that they should be held responsible for, knowing that they will never be able to recoup the value on the house, and not wanting to be stuck in a house that is in the wrong city, the wrong school district, is too small, is falling into disrepair. Conservatives have fought any sort of real relief for underwater homeowners because they believe it might let off people who don’t “deserve” to be free of their bad debt. They bought the house, they should be forced to pay. Letting them walk away without any sort of punishment creates a moral hazard, they say. Republicans are currently strategically defaulting on the United States. An ability to pay the bill is on the table, and the GOP had decided to walk away and let the country default because they don’t like the terms, and they will not negotiate. They have the money to pay (end the tax cuts), but have chosen not to, saying the country can just go without paying the mortgage for a few months. When a family needs more money, they don’t just refuse to feed the kids. They cut the food budget down a little, if there is room, but then they find more revenue, like a second job. And they definitely don’t just stop paying all of the bills until the kids agree to stop eating. It’s time Republicans act half as responsible as the average American family. Is America Caught In The Closed Mind Trap? Is Climate Change a Global Security Threat? Would Michele Bachmann be a submissive president? Which Republican Party Do You Support? Are New Voter ID Laws Jim Crow By Another Name? Bohemian Grove: The New World Order Revealed? Anonymous - We Are All Capable Of Great Things!